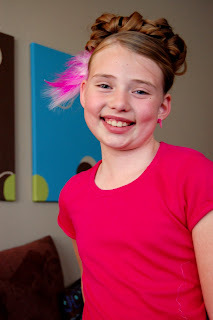 The S Family: Little miss thing turns 9! This sassy girl turned 9 on Friday! This little girl lights up our life. 1. Her sweetness. She is a total love. 2. Her beauty...not only outside but most especially inside. One day she came home from school and told me that she could no longer be someone's friend because they were mean. Thinking that they had been mean to her I asked her what happened. She said she over heard the person being mean to a boy in her class and she didn't like that. So tender. 3. She takes ballet and Karate...such a balanced girl. 4. Every one wants to be her friend. 5. She cries if she can't find exactly what she wants to wear! Love it! 6. She automatically asumes when I say I am having a "girls weekend" that she is included...even though it is just me and my girlfriends! 7. She loves her brothers. She hugs them when she see's them at school. 8. She loves to be silly! 9. She is crafty and artsy. We had a little party at our house. Our hairdresser, Rachel, came over and did all the little girls hair. This is Rachel doing Alexa's hair. The cupcake cake. I just threw a bunch of flowers and a butterfly on it. I think it turned out pretty darn cute. Way easier than fondant. Alexa was so funny on her birthday. She has been talking about this day for weeks...but I think she got a little embarrassed when we sang happy birthday because I could hardly get her to smile. Opening up her Taylor Swift tickets. Showing them off. And yes you see two tickets...you know what that means....I am going to Taylor Swift. All the girls with their fabulous hair. You are so cute Lindsay. You should seriously go into party planning. You've got the gift. Seriously, I am so jealous you get to go to Taylor Swift! Too fun!! Alexa is one lucky gal to have you in her life! Too Cute!! We miss you guys!